What Is a 60-Day Rehabilitation Center? 60-day programs typically include the same services as 30-day and 90-day programs, such as intake, evaluation, detox and therapy. These programs offer more time in a sober environment, and studies show that people who spend more time in treatment have better outcomes. While 60-day programs have many advantages, think about what you can afford and how much time you are willing to spend away from home. When choosing a program, consider the location, staff, success rate and aftercare planning. Who Answers? to speak to a treatment support specialist about 60-day rehab centers in your area. Drug recovery programs can last 30, 60, 90 days or longer, if needed. A 60-day residential program can give you more time to work through the causes of your addiction and begin to build a life without drugs. Sixty-day programs typically include the same services as 30-day or 90-day programs, such as intake, evaluation, detox and therapy. As with any length of residential treatment, recovery doesn’t end at program completion. An effective 60-day rehab program should be part of a comprehensive treatment plan that also stresses aftercare services. The plan should address all aspects of a person’s addiction, and promote effective relapse prevention and long-lasting recovery. You will meet with a team of providers and together determine the best course of action for your treatment. Most extended-stay programs involve inpatient services, but some programs also offer outpatient 30, 60, or 90-day treatment. Dual diagnoses require an extra level of care and concern to effectively treat. An example of a common dual diagnosis is substance dependency and depression. Detox allows your body to rid itself of the substance before you begin work toward recovery. Withdrawal can be uncomfortable and sometimes dangerous, so many treatment centers will medically monitor you to ensure that you are as safe and comfortable as possible during this stage. Counseling is the primary component for long-term drug treatment, and at some point during the first month of treatment in a 60-day alcohol and drug rehab program it will focus on addressing the specific issues that may have contributed to your addiction. These can include medical issues, living situation and other social considerations that may have contributed to the substance abuse in the first place, and learning how to address them head-on will help you resist relapse. During the second month, you will notice stabilization in your day-to-day treatment experience. Therapy sessions will become more regular and day plans will begin to follow predictable patterns. Many people find this stability comforting after the turmoil that substance abuse can cause. You will begin to build upon the first month’s progress toward sobriety by developing and practicing relapse prevention skills. This includes refusal skills, coping mechanisms and how to seek help if you are worried that you might relapse. You will also arrange a comprehensive aftercare program with your doctor. Aftercare includes follow-up counseling appointments, ongoing support group attendance, sobriety monitoring and any other abstinence accountability measures you or your doctor believe are necessary. As therapy sessions progress, you will begin to explore the causes of your substance abuse more in-depth. Your therapist will help you identify the roots of your addiction as well as any additional issues that may have contributed to your substance use, such as family problems or past trauma. With your doctor, you will assess the need for post-treatment living arrangements. These include therapeutic communities, halfway houses and sober living houses. Many recovering substance users find that continuing to live in an abstinent environment after formal treatment encourages their sobriety. Cognitive behavioral therapy – Examining your substance use (including why you started using), developing refusal skills for future temptations, and working on coping mechanisms. Motivational interviewing – Developing your own motivations to change and focusing on taking personal responsibility for your choices. Motivational incentives (also known as contingency management) – Earning positive rewards for sustaining sobriety and meeting treatment goals. Multidimensional family therapy – Involving the family in the treatment of adolescents with a substance abuse problem, improving family communication and functioning, and teaching the adolescent user better decision-making skills. Spend more time in a sober environment. Longer time in a supportive, sober environment allows you to focus more on recovery and build a satisfying life without drugs. Get perspective on your addiction. The extended period of time away from distractions and the original abuse environment lets you examine your former habits from a recovery standpoint. Focus on making positive changes. A longer treatment program provides more time to receive therapeutic interventions and make the psychosocial and behavioral changes necessary to dedicate yourself to recovery. Practice recovery skills. Building new habits prepares you for potential relapse scenarios. You learn refusal skills and how to get help if you’re afraid you might use again. Build your support network. You can develop a supportive network of peers who can become a source of encouragement for you as you work on maintaining sobriety, just as you can provide support and encouragement for them. Cost. Inpatient programs can come with a high price tag. But there are many ways to help cover the cost of treatment. Learn more about using insurance to cover recovery costs and financing recovery. Time away from work or home. Taking time away from home removes you from the original abuse environment. However, you may want to consider outpatient treatment if taking time away is impossible. Location. Is the program in an area that would benefit your recovery? For some, this means staying closer to home. For others, it means escaping your everyday home life. Staff. Are the staff members certified? What is the staff-to-patient ratio? A confident and supportive staff can put you at ease and make recovery a better experience. Success rate. Is the program actually helping people? Do they know their abstinence rates following program completion? A program with a high success rate has a much higher probability of helping you. Cost. How much does the program cost? Does it offer payment plans or income-based pricing? Does it accept your insurance plan? Many programs offer grants for recovering users, and most insurance will cover at least part of your treatment. Find out more about how you can afford substance abuse treatment. Aftercare. What type of aftercare, if any, does the program offer?The best programs will make detailed follow-up care arrangements, or offer some forms of aftercare themselves, whether it be therapy, counseling or self-help groups. 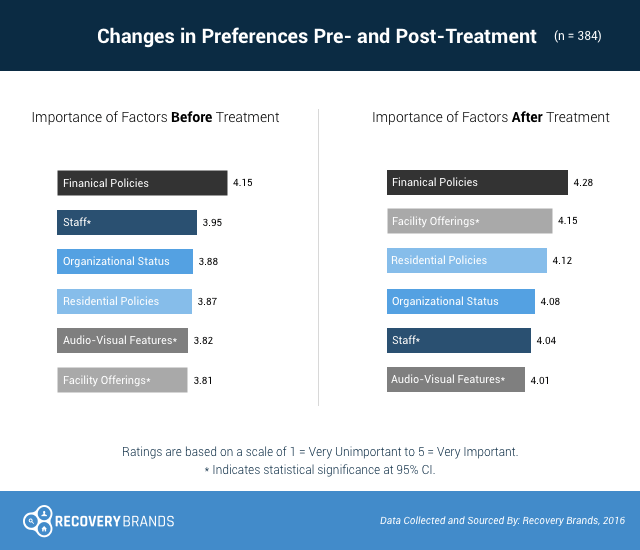 Recovery Brands conducted a survey in 2016 to find out what people leaving treatment consider the most important factors when looking for a facility. Individuals leaving treatment considered financial policies to be the most important, followed by the program’s offerings like food and amenities, then residential policies (visitation policies and privacy), program philosophy and accreditation, and staff. Prioritize your own factors when searching for a program. Contact a treatment support specialist at 1-888-319-2606 Who Answers? about the best 60-day drug recovery program for you.